Your Okamoto spindle is in expert hands with the factory-trained, Big Plus–certified technicians at High Speed Technologies, Inc. We have repaired dozens of Okamoto spindles to original factory performance. Need it fast? We can repair your spindle within three days of customer approval, and we offer reduced pricing for longer lead times. All spindle repairs are backed by a complete warranty and our 30-year reputation of OEM-quality spindle repair. This Okamoto OH-40M spindle was sent to High Speed Technologies because it was making “excessive noise at high speeds”. After initial testing we disassembled the spindle and found the bearings had begun to deteriorate but had not quite reached the point of failure. All of the rolling elements were intact but extremely worn. There was a small amount of particulate observed which resulted in further damage to the bearing race ways. The worn and damaged bearings were the cause of the excessive noise at high speeds the customer had noted. 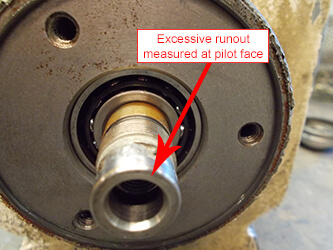 While further inspecting this Okamoto spindle we observed excessive runout at the shafts Pilot face. This spindle rotates up to 40,000 RPM so this runout would likely have resulted in excessive vibration and tooling issues. So we eliminated the runout by Kiss grinding the worn surface on our Kellenberger universal grinder. With our inhouse grinding capabilities we were able to get this spindle back up and running in no time. 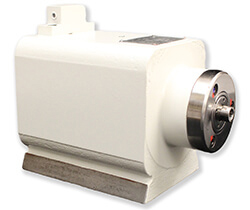 After we replaced all bearings and seals with new, we reassembled the spindle and balanced it up to max speed – 40,000 RPM – and the spindle once again ran like new. But our Okamoto spindle repair doesn’t just end with spindle performance. We work just as hard to ensure the spindle looks like new! So the spindle was cleaned, and prepped for a coat of Hi-Solid 2 part epoxy industrial paint. Once the paint was dry, all oil ports and drains were capped, the spindle was tightly wrapped to prevent rust and corrosion and finally it was safely boxed for safe transport back to the customer. For expert Okamoto spindle repair, call us at 1-603-483-0333 for a quote. We are fast, experienced, and our work is guaranteed.